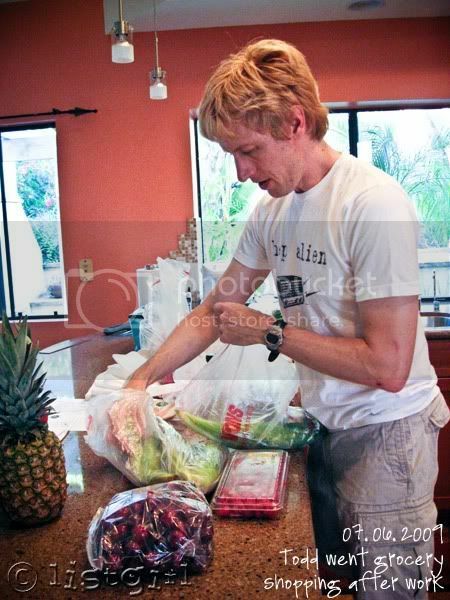 Todd went grocery shopping after work today and got lots of fresh vegetables and fruits. Then he made a tilapia salad with fresh veggies, lettuce, and strips of tortilla for crunchiness. I was in a crabby mood due to various reasons. After dinner we sat down on the couch and Todd said, "how bad can things be when we're together?" He was right and I smiled and gave him a kiss. It's always better when we're together. Which reminded me of this song, one of my favorites from Jack Johnson. Yummy fruits Todd bought!! Love fresh fruits! You can be glad to have Todd at your side. So sweet! Being married to your best friend is such a huge blessing..thanks for reminding me. I think I'll go find my friend and give him a 'Good Morning' kiss. It is so great to have love and support at home! Hope you get to feel better soon. I love fresh fruits and veggies! are those Bing cherries I see? we have been loving those here! and it is precious to have someone with whom everything is better! hope you are feeling better now!